Honeycrisp apples, McIntosh apples, Cortland apples and Macoun apples are just better when they are shipped from colder areas. Apples. Autumn Crisp, Cameo, Cortland, Empire, Fortune, Fuji, Gala, Golden, Honeycrisp, Jonagold, Macoun, McIntosh, Mutsu, Red Delicious, Rome, Spartan, Stayman, Winesap, apples. Farm fresh. Order a box delivered to your door or a truck load to your store! Order the New England favorite, Macoun apple gift box only till March. license of Honeycrisp.com USA, Inc. When ordering apples online always check to see what type of packaging is used. When we ship your apples they will arrive in the best of care in their soft foam apple gift box. 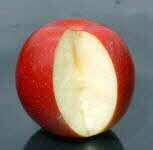 Honeycrisp TM Apple is a trademark of the University of Minnesota.